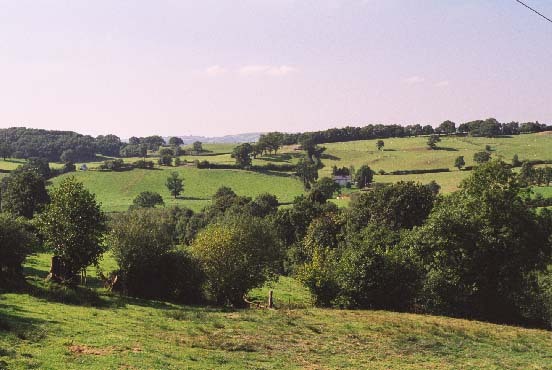 An area southeast of the River Tywi lying in the former Cantref Bychan which was invaded by the Anglo-Normans under Richard Fitz Pons who established a caput at Llandovery in 1110-16 (Rees n.d.). It was acquired soon after by the Clifford lords of Brecon as the Lordship of Llandovery but retained native tenurial customs until the end of the Medieval period when it was incorporated within modern Carmarthenshire. The area was divided between two commotes, Hirfryn to the north and Perfedd, specifically Maenor Myddfai (and Myddfai parish), to the south. The latter may have been administered from Myddfai itself but Cilgwyn Mansion had been established by the 16th century (Jones 1987, 30), and the nearby mill is marked by Rees on his map of 14th century south Wales (Rees 1932). With 3820 acres in Myddfai parish in 1873, the occupants of Cilgwyn Mansion, the Gwynne-Holfords, were the chief family of the parish. A second gentry house nearby, Glasallt, is said to have been the home of the Owen family since 1508 (Jones 1987, 80). Llwynwormwood in the northern part of the area, now gone, was a later 18th century gentry house and home of the Williams family, also of Dolgarreg and the second family of Myddfai parish (Jones 1987, 122). A small emparked area also lies around Glansevin, at the southern end of the area, which had been the home of the Lloyd family since the 16th century and was assessed at 8 hearths in 1670 (Jones 1987, 78); it is now a hotel. The landscape within the area exhibits a varied pattern of enclosures; those to the south are irregular and may have been established by the early Post-Medieval period, while those to the north are more regular and probably later in date. The landscape around Cilgwyn and Llwywormwood was extensively emparked in the 18th- and 19th-century with much tree-planting. Small-scale mining activity is represented by Allt Rhydings and Paradise Lode, small copper/lead shafts in the north of the area, and a lead/zinc shaft in the south of the area. There has been little recent development. 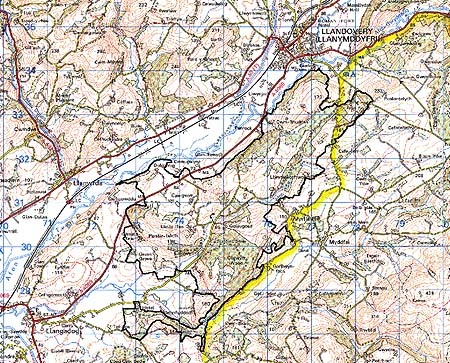 Cilgwyn-Llwynwormwood character area lies across a wide hilly ridge which trends southwest-northeast on the south side of the Tywi valley between Llandovery and Llangadog. The ridge rises from approximately 60 m on the valley floor to achieve heights of over 180 m. The area is heavily wooded. This consists of deciduous woodland on steep valley sides interspersed with and under-planted by 20th century conifer plantations. There are also substantial conifer plantations on the ridge crests. Although some of the deciduous woodland is probably ancient, especially that on the steeper slopes, much has the appearance of 18th- or 19th-century plantations, part of the estate landscape. There are several large estates or former estates in the area. The mansion of one of the largest, Cilgwyn, still exists, along with various associated relict garden features, but the other main house of the area, Llwynwormwood is now a ruin. Dolgarreg and Cwm-Rhuddan, two lessor major houses still stand. Outside the wooded areas, the main land-use is pasture. This has been divided into fields which are large and fairly regular on higher levels, smaller and more irregular at lower levels. Earth banks with hedges form the boundaries to the fields, but apart from alongside roads and tracks hedges are in very poor condition, especially so at higher elevation, and are either overgrown or derelict. Wire fences provide most of the stock-proof boundaries. Many hedges have distinctive trees, and there are individual trees and small clumps present across much of the area. Parkland is still present as at Cwm-Rhuddan, but virtually the whole area seems to have been subjected to landscaping by the estates in the 18th- and 19th-century. Outside the major houses, the settlement pattern is of dispersed farms and other dwellings. Farmhouses are substantial, stone-built, generally 19th century in date and have a wide range of stone outbuildings reflecting estate management. Most farms have modern agricultural buildings. Other dwellings are mostly 19th century cottages or houses, usually in the vernacular style, with a few 20th century buildings. Recorded archaeology comprises a possible hillfort, three metal mines, estate and parkland features, and several unknown cropmark/earthwork/landform features. There are many distinctive buildings of which the 18th century Cilgwyn house and one of the Llwynwormwood park lodges, from the 18th- or early 19th-century in picturesque 'estate' Gothic style, are Grade II listed. Glansevin, from the 18th- and 19th-century with Classical features, is Grade II listed. Mansions, parkland and woodland distinguish this area and mark it out from the neighbouring areas of farms and small fields.